Rob Walling joins me to talk about his “portfolio” of startups and his approach to bootstrapping and scaling up one startup to the next. 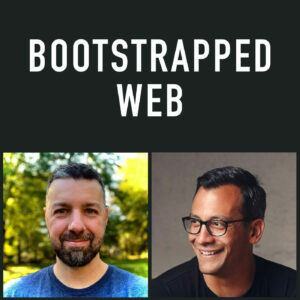 Rob is the co-host of the popular Startups For The Rest of Us podcast, and founder of quite a few bootstrapped businesses such as Hittail and his latest, Drip. He blogs at Software by Rob. I was really excited to have Rob on today because I think he has carved a pretty different path than most entrepreneurs. He really takes the “portfolio” approach to building businesses. Instead of starting just one company and growing and growing growing that, what Rob does is he starts one, scales it up, puts people in place to run it, then moves on to the next thing. So that’s what I dug into in this interview. I wanted to really understand how he goes about navigating one startup to the next. We talked about his approach to hiring, how he chooses what to do next, and how he’s able to manage it all. Rob starts by putting VA’s in place to handle tier-1 support, but then scales up to the point where people are in place to run all aspects of the business. That includes a dedicated product manager, who has been trained to make strategic decisions the way Rob would. He mentioned how 19 out of 20 decisions would match the same ones Rob would make himself, and even the if one decision goes a different way, it’s worth it to give Rob that freedom to focus on his next thing. That’s a very inspiring takeaway because it gives me something to strive for in the future. One of the factors he looks for when deciding which business ventures to take on next is whether or not the idea could 10x his previous venture. He’s always growing and always challenging himself. That’s the kind of thing that really shows how far Rob has taken the entrepreneural path. Again, very inspiring. It sounds like Rob’s ventures are trending away from the B2C space and now focusing on B2B. But to take this further, his latest ventures tend to be marketed towards entrepeneurs and marketers, which is in line with the thinking of Nathan Barry, Brennan Dunn. The key takeaway here is that if you’re looking to take the portfolio approach — building lots of businesses, not just one — then it probably makes the most sense to focus your energy in one particular space, the one that you’re most passionate about. The benefit of building an audience — at least in Rob’s case — isn’t so much about building a large stream of customers for his apps, the real value of building such a large audience is it gives him an incredible network. He can look to his network to build that early access list for a new app, or he can look to his network to find a new hire, or get feedback. This really brought to light one of the biggest hidden benefits of building an audience. Another good one Brian. Thanks. Just subscribed to Rob’s ‘cast as well. Great stuff! I love Rob and follow him all around from his podcast, to Microconf, now to here. Thanks for putting this together, Brian! Thanks for tuning in Dave! Ya Rob’s the man.